Winter squash represent a lot of the challenges that an urban farmer in Buffalo is up against… Issues like space, insects management, disease, climate, & interactions with a diverse community. SPACE – If you’ve ever grown a squash or pumpkin plant you know how much space they take up. By mid-summer their vines sprawl well beyond whatever bed they were planted in, into the paths, yard, or even up the side of a fence or house! For the urban gardener space is at a premium, & so we are always finding ways to squeeze squash into our tight spaces. We’ve tried trellising, succession planting (planting another quick-growing crop in between baby squash plants), & trying new varieties, all to deal with spacing. We’ve found two “bush” varieties that over the past few years have fit well into our gardens, taking up much less space than more traditional varieties. REBA squash, which stands for Resistant Early Bush Acorn, resists disease, produces fruit early before bugs kill the vines, & has a compact structure. Burpee’s Butterbush is a great compact butternut squash. INSECTS – Insect management can be a make or break issue for an organic farmer, & squash in particular have a lot of pests. First, squash seedlings can be devastated by cucumber beetles. They attack all cucurbits (the squash, pumpkin, cucumber, melon family) and if they don’t eat all the seedling’s leaves, eventually the full grown plant will succumb to a wilt disease caused by a bacteria the cucumber beetles carry. Squash bugs & stink bugs also eat mature squash fruits, but one of the most devastating pests is the vine borer moth. The adults emerge in early summer & lay their eggs at the base of a squash stem. The larvae bore into the stems & eat out the middle of the stalk until eventually the plant is cut off from its root system & dies. We try to cover our squash with a white permeable material called row cover, in late spring & early summer to keep the moths off. However, eventually we need to let the pollinating insects on to the plants so the squash flowers turn into actual squash. So eventually the beetles lay their eggs & by August many of our plants are starting to die off. Zucchini, Spaghetti, & the super sweet Buttercup squashes seem to be the most susceptible to the vine borer because they have hollow stems. 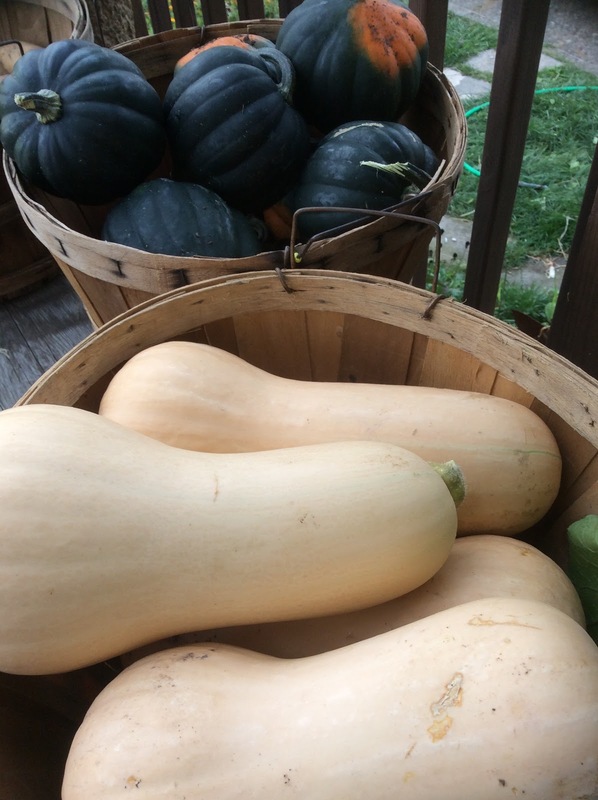 Last year we trialed a new hybrid variety created by breeding a butternut squash (that has a solid stem & tends to resist the vine borer) with the buttercup squash. The variety is called “honeynut” & it has a small butternut shaped squash that has the super sweet flesh of the buttercup. Pollinating insect populations can also be an issue for urban gardeners. Some urban areas can have very low numbers of pollinator insects (mainly bees, butterflies, & moths) due to the general lack of food to forage for. This is a problem for squash in particular because they have separate male & female flowers. The pollen must get carried from inside the large male flower to the inner parts of a female flower in order for a squash to grow. Some farmers will even pick the male flowers & tie them onto a female flower to ensure pollination. Keeping honeybees onsite is another way to boost the number of pollinating insects in the garden & upping your odds of getting squash to grow. DISEASE – Besides sprawling vines, squash plants are also known for their large broad leaves. To our African neighbors these leaves are a delicacy. They are also great a suppressing weeds in a garden bed by shading them out. These broad leaves act as large solar collectors, turning the sun’s light into the sugars that make our winter squash so delicious. In a dry summer like this one they can serve another vital role, as they act as rain collectors, directing whatever rainwater that falls towards the center of the plant & its root system. However, this water collecting ability in a normal growing season here along the Great Lakes ends up being a liability. Even in dry summers, as late summer mornings are cooler & heavy dew forms on the leaves, the perfect environment for fungus to grow gets created. Diseases like powdery mildew can be seen on just about every organically grown squash plant by this point in the season. Eventually this robs the plant of its solar energy collecting abilities, & it dies. Making sure to water mature squash plants from below using soaker hoses or drip irrigation can delay the onset of disease. If you must water from above, do so early in the morning so the rising sun can quickly evaporate moisture on the leaves. CLIMATE – Like so many of the annual veggies that we prefer to eat, squashes are native to sub-tropical & tropical regions. While many have been bred over millennia to grow in our climate, they thrive in hot weather & need a long frost-free growing season to produce fruit. In WNY soil doesn’t warm up to germinating squash seeds liking until early June (and squash seedlings do not transplant well, as they don’t like their roots being disturbed), then many varieties take four months (100-120 days) to mature, & our frosts can come as early as the first week of October. So you can see the window for growing squash in WNY can be tight. In cool summers it can take what seems like forever for the fruit to actually ripen. Again using row cover, or other season extending practices (growing on a south facing slope, or under movable high tunnels) can also help maturing fruit along. COMMUNITY INTERACTION – That same year that my neighbor stopped by to offer comment on our squash patch, another neighbor (or perhaps neighbors) had stopped by a few weeks earlier. While I was gone for Labor Day weekend someone came & picked our entire crop of still maturing butternut squash. Such large scale theft in our garden is actually quite rare, & through continuing conversation with some of our other Asian neighbors, I have an idea of why this happened. Many Asian cultures eat the vines, leaves, & young green fruits of the squash. They don’t prefer the sweet taste of the mature fruit, but rather the tart crisp flavor of the young ones. Before I left for the weekend, I had thought to myself about how great the butternut crop was coming, & that in just a week or two they would be ripe. I think our neighbors looked at them & thought that in a week or two they’d be no good at all, & that I was letting them all go to waste. Different cultural perspectives, preferences, & values greatly shape who enjoys food from our gardens & who participates & in what ways. Learning from each other will be the only way we will have an urban garden that truly feeds the community as a whole. Organic urban farming often means managing a complex system with many interconnected parts. It does take a lot of work, but there are beneficial yields. Of course there are the delicious fall squash soups & dishes, not to mention scrumptious pies & desserts. But beyond all that, the whole process teaches humility. We have so much to learn… from listening to each other, from carefully studying the natural systems all around us, & by staying connected to the One that created & sustains it all!